This entry was written by thecitizensmemorial, posted on October 7, 2013 at 7:52 pm, filed under Uncategorized. Bookmark the permalink. Follow any comments here with the RSS feed for this post. Post a comment or leave a trackback: Trackback URL. The “The Citizens’ Memorial” website is a treasure trove of interesting information, beautiful illustrations and photographs, all of which serve to inform in great detail the purpose behind putting forward such a proposal. Furthermore, the noble and creative vision to rebuild the missing walls of the battered and abused Christ Church Greyfriars and create a memorial of national monument status for the 28,000 citizens who lost their lives as a direct result of the aerial bombardment of the whole city of London in World War Two is an excellent idea and a unique opportunity to celebrate Sir Christopher Wren’s very important but somewhat neglected and under-appreciated church, whilst simultaneously venerating the deaths of so many with a well deserved memorial befitting the scale of the tragic loss. 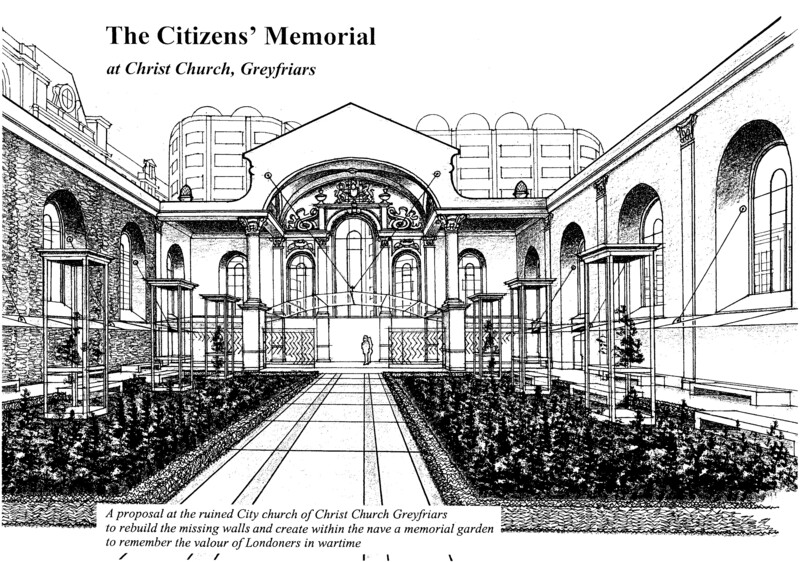 Restoring part of the church and bestowing Christ Church Greyfriars as the sanctum of “The Citizens’ Memorial” is an honourable and virtuous concept which would rightly reclaim the once sacred and hallowed site, and create a quiet and dignified space akin to that of the purpose originally intended in the 1300s. Christ Church Greyfriars is about midway on a chain of historical sites, beautiful buildings and interesting places stretching from the Barbican Arts Centre to The Tate Modern, almost in a straight line. Starting off from the Barbican :- The new Milton Court Theatre, Roman Wall, Museum Of London, Old General Post Office Building, Postman’s Park, Christ Church Greyfriars, Paternoster Square, St Paul’s Cathedral, Millennium Bridge, Shakespeare’s Globe Theatre and The Tate Modern, all of which can all be viewed within a twenty minute leisurely walk. Moreover, whilst standing on the Millennium bridge the ancient Tower Bridge, London, Southwark and Blackfriars bridges can all also be viewed along with the more recent attractions – London Eye, Gerkin, Shard. The valuable addition of the “The Citizens’ Memorial” would link another fine gem to the illustrious chain of the City Of London’s national treasures. It would serve to connect and complement the somewhat understated memorial plinth in St Paul’s Cathedral churchyard and gracefully unite Sir Christopher Wren’s finest works. It would be wonderful to see the “The Citizens’ Memorial” proposal approved by The City Of London, whereupon the next stages towards completion of the project could commence. Surely, The City of London have an obligation to fulfil. It should be seen as a duty of honour to commemorate the deaths of the many unfortunate citizens who lost their lives by providing a significant national monument. Making Christ Church Greyfriars the designated area for the monument (the perfect place) and allowing the restoration of the church walls this would give the City Of London the opportunity to redeem the outrageous decision to demolish a wall of one Sir Christopher Wren’s finest works for the purpose of widening a road! An Unbelievable act of total disregard for our national heritage. The Citizens’ Memorial is a marvellous idea which could help to right two wrongs – the thoughtless destruction of the church wall and the need to honour the City of London’s tragic loss with a national memorial proportionate to the scale of the tragedy. Wishing you every success with your proposal. As someone who visits London occasionally and knows little of wartime London, I am surprised to learn that more than 28000 citizens died as a result of WW2 bombardments. I believe this to be a wonderful concept which would preserve a piece of London’s history as well as commemorate those who lived and died there. It would seem to me to be a perfectly appropriate place to build a memorial – a place of peace, a place to bring an awareness to members of the public who, like me, are unaware of the sacrifice of lives of some 28000+ ordinary people. Wishing you every success in this proposal and venture. I recently had the opportunity to visit the Greyfriars site. This reinforces my view that the site is perfect for the purpose of a citizens memorial, it is such a perfect location. Come on ‘City of London’, grab this opportunity to pass the planning proposal! This is a wonderful project. There is something deeply moving and appropriate in the idea that London citizens who lost their lives in the Second World War would be honored at a London church that lost its own life alongside them. I first came to know Christ Church Greyfriars in 1998, when I was a correspondent for the Washington Post, working on an article about the Wren churches. In subsequent research for a book that I was writing, I was astonished to discover how much history and heritage the centuries have packed into this one place. Yet today hardly anyone knows there was a huge medieval church here that was a focus of the religious civil and social life of London. Knowledge of the great Wren church that followed is equally scant, including its loss in one of the fiercest raids of the war on the night of 29 December 1940. I watched with interest as the church regained its original footprint through the Merrill Lynch development. It would seem right to now take the next step and put back the glorious east wall that was taken in the name of traffic circulation. There would be created an ideal place in which today’s citizens would recall the church and the wartime sacrifices of their forebears. Citizens gave up their lives in the streets and buildings around Christ Church. Others committed remarkable acts of bravery. With the church ablaze that night in 1940, a postal worker ran inside to recover one of the few fittings that survive, the top of the baptismal font (now to be found at St. Sepulchre-without-Newgate, a short walk away). Walking by the church today, you’d hardly know that any of this had happened. Let’s change that! What a wonderful project and I wish you the best of luck with making it happen. While we hear a great deal of the spirit and the bravery of the Londoners during the war, I don’t think there is an awareness of the suffering of the civilian population in wartime. This would provide a place to reflect and remember their stories. I couldn’t agree more with all that has already been said. This beautiful monument seems to address so much in so many different ways – both past and present – and at the same time manages to remain very simple in design and concept. It demonstrates the desolation of war and conflict and the way healing and peace can rise from the rubble of lives lost and torn apart. Establishing a safe haven to reflect on this would not only honour all those who lost their lives but also support the living in their present day struggle to find peace. I hope you succeed with this project. What a wonderful & inspirational idea! The creation of a sanctuary of natural peace, within a part restoration of an historic church in the heart of frenetic London. This is a loving intention of healing grace, to make sacred once again this heart with so many connections to our past, and further to dedicate it to the memory of souls who lost their lives in violence. It is a project worthy of all the help and support it needs. A potent and appropriate statement for the times.